Boracay, Philippines is one of the world’s top tourist destinations. Every year, thousands of local tourists and foreigners go to Boracay to enjoy the stretch of beaches covered with white sands and coral reefs. Boracay is 345 kilometers away from the south of Manila. It is an island located in the province of Aklan that is 7 kilometers long and 1 kilometer wide. Apart from its white sand beaches, Boracay is also famous for being one of the world's top destinations for relaxation. It is also emerging among the top destinations for tranquility and nightlife. In 2012, Boracay was awarded as the best island in the world from the international travel magazine Travel + Leisure. Three communities make up Boracay: Yapak, Balabag and Manoc-manoc. Both Yapak and Manoc-manoc are characterized by hills that are elevated up to a hundred meters above sea level. What link these three communities are tropical jungles that boast the most colorful greens. Weather in Boracay is generally divided into two seasonal weather patterns known locally as the Amihan and Habagat seasons. In the Visayan language, Amihan means a cool northeast wind, and Habagat means west or southwest wind; south-west monsoon. The Amihan season is characterized by moderate temperatures, little or no rainfall, and a prevailing wind from the NorthEast. The Habagat season is characterized by hot and humid weather, frequent heavy rainfall, and a prevailing wind from the west. Daytime temperatures on Boracay generally range from 77–90 °F (25–32 °C) from the beginning of the Amihan season into February or March, and increase to the 82–100 °F (28–38 °C) range with the onset of the Habagat season. For those interested in Scuba Diving and Diving Packages, there are literally dozens of Dive Centres along the White Beach; it is a good place to learn or to improve your skills. Cost is typically $33 per dive which includes hire of all equipment. The dive centres operate a cartel and have agreed standard prices amongst themselves so prices will be the same at all centres. There are 25-30 dive sites within 10-15 minutes speed boat ride from the beach, suitable for beginners up to advanced level. Dives range from 'Angol Point' (10m), through 'Crocodile Island' (22-25m), a straightforward wall dive, up to 'Yapak'- a deep wall dive suitable for only the most experienced divers due to strong currents, although there is the possibility of seeing sharks and stingrays. 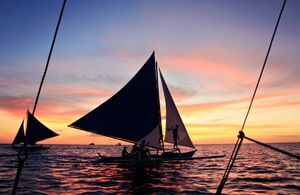 One way to see the beauty of Boracay and its various beaches is by Paraw (native outrigger sailboat), which sail along White Beach every afternoon just before sunset. You will be constantly asked if you want to take a boat trip, as there are literally dozens of companies offering this service. Boracay's Bulabog beach is known as the best kitesurf destination in Asia. The season runs from November through to April with onshore winds varying between 12-30 knots. 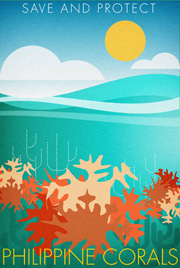 Small lagoon (2km wide) is protected from waves with coral reef. Water becomes almost flat on a low tide, making it easy to start learning kitesurfing and continue with freestyle tricks. Skimboarding in Boracay has been a new fun sport for kids and entertainment for older for people for several years. It is a welcome new attraction and a pleasure to watch. Skimboards are available for rent at several places along White Beach. It is worth hiring motorbikes or scooters out to explore the island, as there are other beautiful beaches on the other side of the island that are even better for snorkeling that are not as crowded as White Beach. Hire them for a couple of days and you should get a discount. The roads are a bit dodgy, and some are still being constructed, so use caution. Horseriding is a fun activity in Boracay. Get off the beaten path and experience villages and scenery most other visitors don't get to see. All levels of experience are catered to. Ask a tricycle to take you to the Boracay Horse Riding Stables. If you want to get to the island, all that you have to do is fly from the Caticlan or Kalibo Airport. There are direct flights from Manila and Cebu to these air gateways. The small island still experiences scarcity of electricity and public transportation, but the nights in Boracay make you forget this lack. Getting around the island of Boracay is simple and easy. For you to go from a place to another, you can use any one of the three transportation means: tricycles and Pedi cabs; motorbikes and bicycles; and shuttle services from your hotels. There are hardly any taxi cabs in the island because everything can be done by means of walking. You are going to see almost every visitor walking barefoot around this magnificent island.